In the 1530s, Duke Albrecht III had the "Pluedenburg" on the River Würm, around 10 kilometres away from his town residence, converted into a country seat. 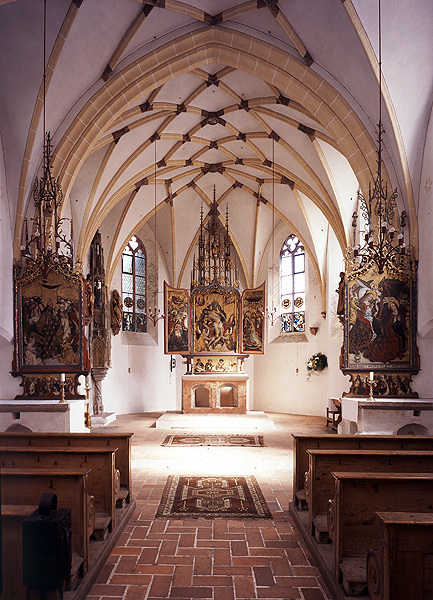 In 1467 his successor, Duke Sigismund, abdicated in favour of his brother Albrecht IV and withdrew to Blutenburg, which he extended from 1488 with a chapel beautifully furnished in the late Gothic style. Duke Sigismund died at Blutenburg in 1501. 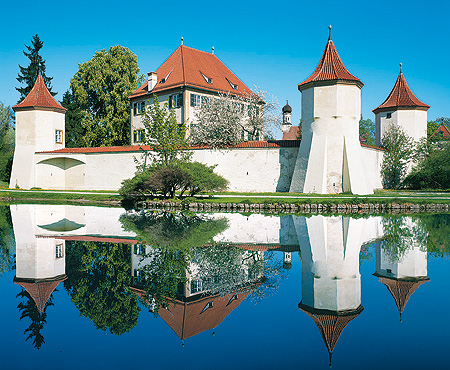 The present complex still reflects the structure of the 15th-century moated castle with its main building – where Duke Albrecht III lived with Agnes Bernauer – surrounding wall with towers and spacious outbuildings, which are dominated by the chapel. The palace chapel, furnished with late-Gothic masterpieces, is a simple building with a single nave and a choir enclosed on three sides. The three altars by Jan Polack are among the best examples of panel painting from the late-Gothic period. The main altar, with both wings closed, shows the saints Bartholomew and Sigismund, together with the duke as patron. When open, the left wing of the altar shows the baptism of Christ and the right wing the coronation of Mary with the Holy Trinity on the throne. The throne motif recurs in the majestic representation of the mercy seat in the central picture of the altar. The side altars – Christ as King among the saints and the Annunciation – date from 1491. The wooden statues of the twelve Apostles and the figures of the Man of Sorrows and Our Lady of Sorrows from the last decade of the 15th century were also part of the first interior. They are the work of an unknown sculptor known as the "Master of the Blutenburg Apostles". Further items belonging to the original furnishings are the tabernacle dated 1489 and a cycle of glass paintings with coats of arms and scenes illustrating the redemption story (1497). Blutenburg Palace today houses the International Youth Library. The admission to the chapel is free.